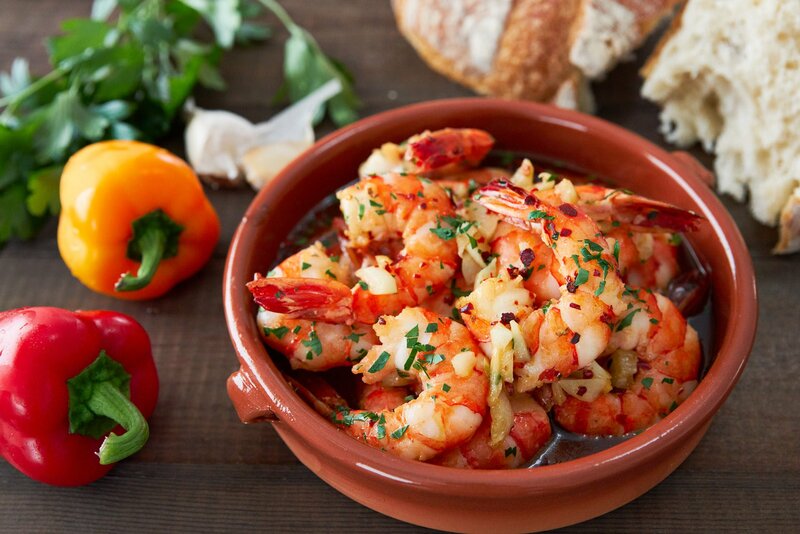 With fresh briny shrimp cooked together with loads of garlic and olive oil, Gambas al Ajillo or "garlic shrimp" is a classic Spanish Tapa that's soul-satisfyingly good. Serve it with a crusty loaf of bread to sop up all those juices, and you can be sitting down to eat in less than five minutes! As with any simple dish, the quality of the ingredients will make a significant difference in the quality of your garlic shrimp. 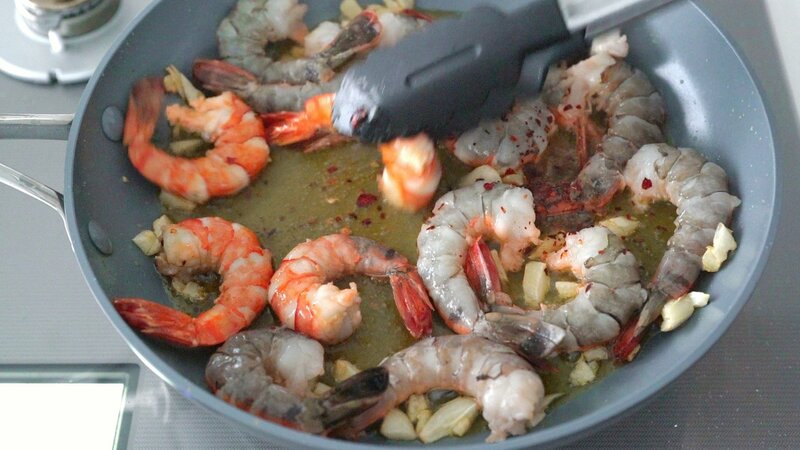 The key ingredients here are shrimp, garlic, olive oil, and red peppers. Have a look below for my recommendations for each of these. I would strongly recommend using high-quality jumbo shrimp for this. The size of the shrimp is important because they will shrink quite a bit as they cook. The smaller the shrimp, the faster they’ll go from raw to overcooked. In an ideal world, you’ll want to use fresh shrimp that has never been frozen. Given how most shrimp these days is “farmed” in factories halfway around the world, this can be tough. The next best thing is to get wild shrimp that has been flash frozen. The quick freezing preserves their freshness while the speed prevents large ice crystals from forming in the shrimp. It’s these ice crystals that are responsible for giving conventionally frozen shrimp a spongy, dry texture when cooked. 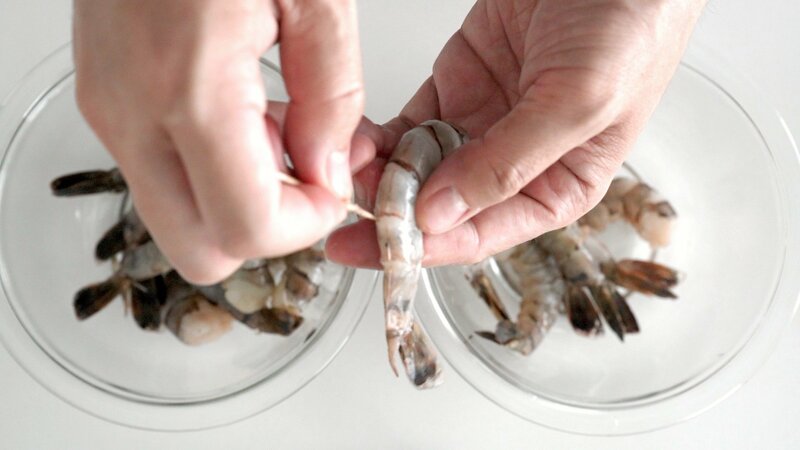 An excellent way to test if your shrimp was flash frozen is to squeeze the defrosted shrimp. If a bunch of liquid comes out, then it was probably not flash-frozen (or it’s been in the freezer for too long). As for the type of shrimp, I’m a big fan of Carabineros for Gambas al Ajillo. It’s a ridiculously large and bright red shrimp that’s found in the Eastern Atlantic, but let’s be real, they’re tough to get outside of Europe, which is why I’ve prepared this one using the humble black tiger shrimp. When deveining your shrimp, I recommend doing it with a toothpick rather than butterflying it with a knife as it preserves the texture of the shrimp while making it harder to overcook. Check out my video below for the technique. The trick here isn’t with the type of garlic, but with how you prepare the garlic before it goes into the pan. In the US I often see restaurants passing the garlic through a press, which thoroughly pulverizes it. This tends to be a little heavy handed as the garlic ends up being the dominant flavor, and shrimp get lost in the sea of stink. At the other end of the spectrum, I’ve seen places that include whole garlic cloves. This is fun because the garlic ends up caramelized around the edges and sweet and creamy in the center, kind of like roasted garlic. The problem with this approach is that the garlic doesn’t infuse the oil with as much flavor as I’d like. I came across the solution to this dilemma at a tapas bar in Barcelona, where they smashed the garlic into big chunks. 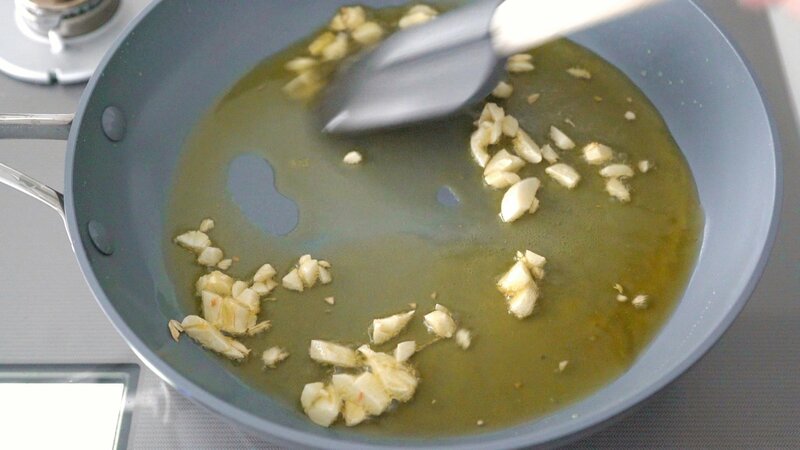 The bruised edges of the garlic infuse the oil with just enough flavor, without being overpowering. Like pungent punctuation marks of garlic, this preparation leaves room for the sweet, briny flavor of the shrimp to come through. The other key component to the flavor of this dish is the olive oil. 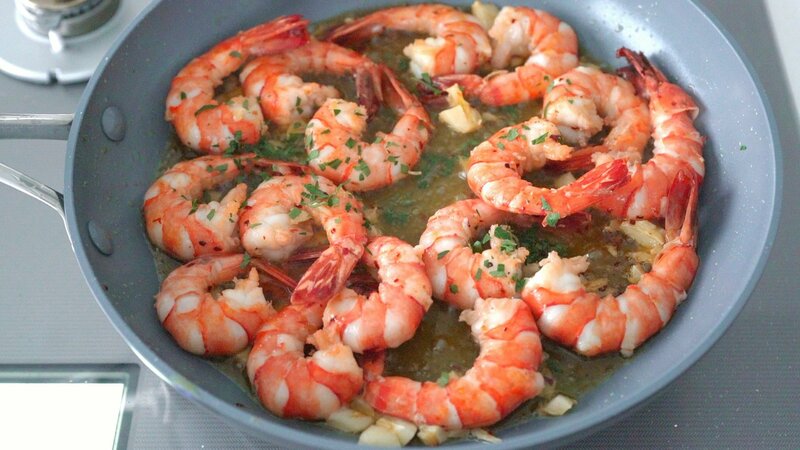 I like using a smooth buttery Spanish olive oil for this as one of the best parts of Gambas al Ajillo is the flavorful oil at the bottom of the pan. It’s not always fool-proof, but I’ve found you can often tell a bit about the flavor profile of the olive oil by its color. Vibrant green olive oils tend to be quite sharp and spicy while a more golden hue tends to indicate the oil is more smooth and mellow. 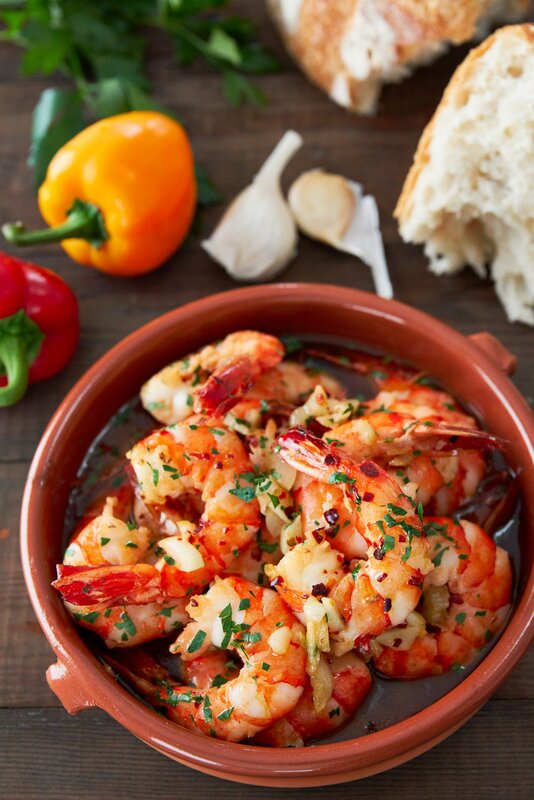 In the US, Gambas Al Ajillo often shows up garnished with bright red ground paprika. The traditional method is to use torn or crushed flakes of dried chili, which imbues the oil with a vermillion hue and lends a marvelous earthy sweetness to the shrimp. I used La Chinata brand paprika flakes this time because they’re not too spicy, and they add a wonderful smoky flavor to the dish. Other chili peppers I’ve used that have worked well are Cascabel (which is the traditional choice), Guajillo, and Aleppo. 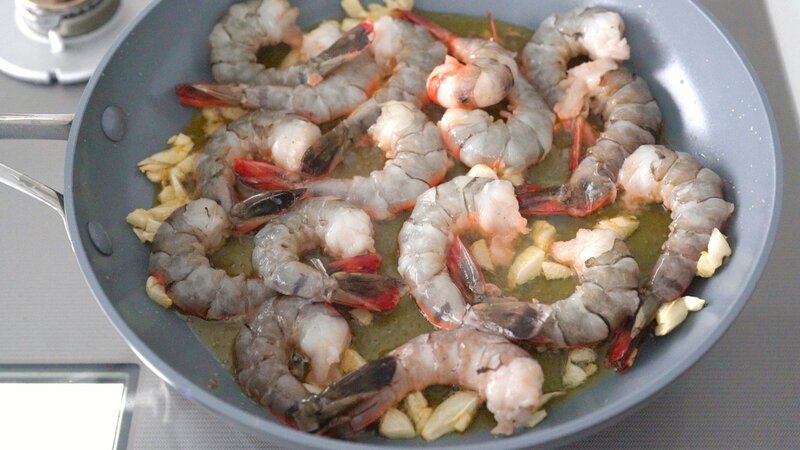 The traditional method for preparing this dish is to cook the shrimp and garlic in a terracotta dish called a cazuela de barro. Then the garlic shrimp is presented while sizzling hot in the dish it was cooked in. It’s impressive looking, and the hot sizzling oil wafts the sweet aromas of the caramelizing garlic and savory shrimp towards your nose, but the problem with this approach is that it needs to be eaten immediately: as in risk second degree burns to your mouth before the shrimp overcook. Otherwise, the shrimp continue to cook in the hot cazuela and will end up tough and dry. The thing is, aside from the aesthetics and keeping the oil hot, there isn’t a ton of merit to using the traditional clay dish. That’s why I prefer to make this in a frying pan. Once it’s done, you can transfer it to a cazuela de barro if you have one, or other dishware that’s conducive to dipping. It’s still a good idea to eat it quickly though as there will be some carryover cooking, but it won’t feel like a tongue-scalding race to get the shrimp out of the dish. 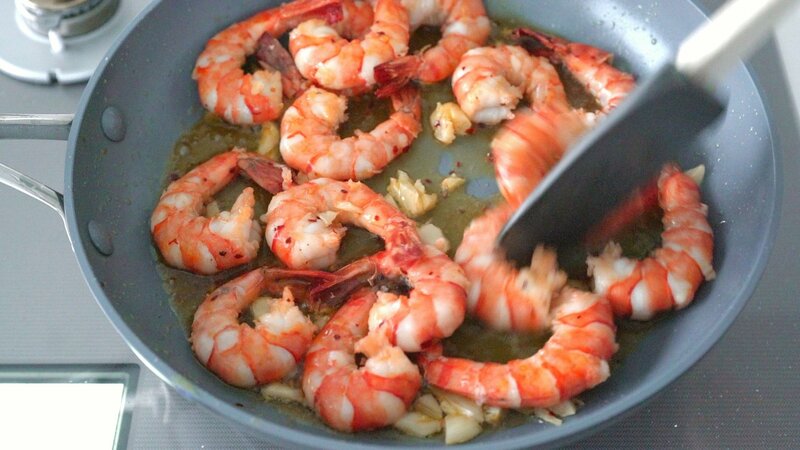 Be sure to serve this with lots of good bread to soak up all that delicious garlic shrimp infused oil. I like tearing the loaf into pieces instead of slicing it as the rough edges soak up the oil better. Obviously, swapping the shrimp out for other ingredients would by definition change the name of the dish, but there are other classic various of **** al Ajillo, like Pollo al Ajillo (chicken) and Angulas al Ajillo (baby eel). For a plant-based option, I love making this with Okra, which doesn’t taste anything like shrimp, but looks stunning and tastes amazing (assuming you like the texture of okra). Peel and devein the shrimp (see the video for my technique), and then pat them dry with paper towels. This helps keep them from splattering as much when you add them to the hot oil. Heat a frying pan over medium heat until hot and then add the oil and garlic. Fry the garlic until it's fragrant and just starting to brown around the edges. Add the shrimp in a single layer and fry them on one side until they're cooked about halfway through. Season with salt and the pepper flakes and then flip them over. Finish by stir-frying until the shrimp is barely cooked through and then garnish with parsley. 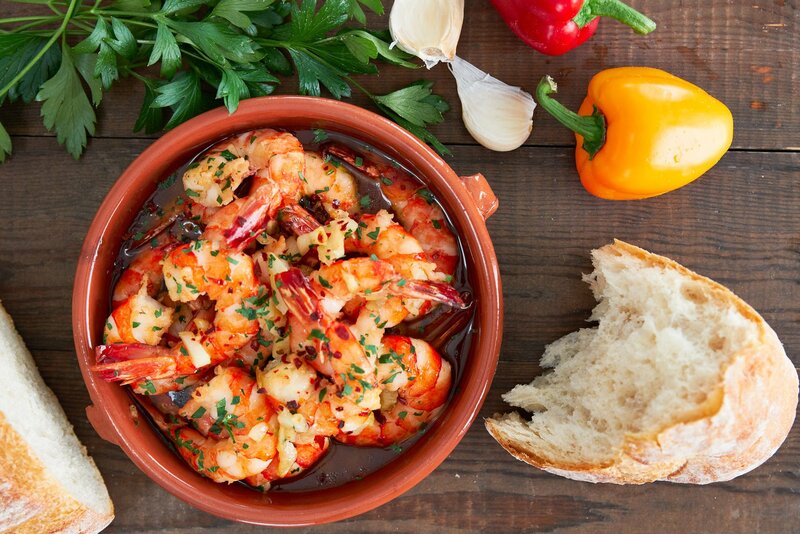 Serve Gambas al Ajillo with plenty of crusty bread and a crisp fruity wine such as a Verdejo or Cava.